iCloud Photo Library across various Apple devices. Apple, Inc.
An iPhoto library can hold up to 250,000 photos. That's a lot of images; in fact, it's so many that you may wonder why you'd ever need to break your existing iPhoto library into multiple ones. The answer is, you probably don't have to break single library up, but you may want to do it anyway, to better organize your images or to improve iPhoto's performance. By using multiple libraries, you can reduce the total number of photos iPhoto has to load, thus ensuring snappier performance. You can also save time because the time it takes to scroll through a large library of images can be considerable. And while Albums and Smart Albums can help with organization, you may find that it takes even longer to find an image when you have to try to figure out which of your many albums contains the image. Multiple libraries can also help you focus on the topic at hand, instead of being distracted by unrelated images. Plenty of storage space. You might think that the amount of drive space you're currently using for your iPhoto images is sufficient, but during the process of creating multiple libraries, you'll be duplicating some iPhoto master images. This can require a great deal of storage space, depending on the format the masters are stored in (JPEG, TIFF, or RAW). After you finish creating multiple libraries, and you're satisfied with the results, you can delete the duplicates, but until then, you'll need the extra storage space. An organizational plan. Before you begin, you need to have a good idea of how you will organize your images into multiple libraries. Since iPhoto can only work with a single library at a time, you need to decide in advance how you're going to divide up your images. Each library should have a specific theme that doesn't overlap other libraries. Some good examples are work and home, or landscapes, vacations, and pets. Plenty of free time. While creating libraries and adding photos is a relatively speedy process, it can take a fair amount of time to come up with a good organizational plan. It's not uncommon to go through multiple iterations of a library structure before hitting on the one that feels right. Remember: Until you're sure you're satisfied with the results, don't delete the duplicate masters stored in your original iPhoto library. With the above as background, let's get started with creating and populating multiple iPhoto libraries. While it's true that iPhoto can only work with a single library at a time, it does support multiple libraries. You can choose the library you want to use when you launch iPhoto. Creating additional iPhoto libraries isn't a difficult process. While it's true that iPhoto can only work with a single library at a time, it does support multiple libraries. You can choose the library you want to use when you launch iPhoto. The process of creating an iPhoto library is fairly simple; we outlined a step-by-step process in the iPhoto Libraries - How to Create Multiple Photo Libraries in iPhoto '11 guide. Follow this guide to create the iPhoto libraries you plan to use. The new iPhoto libraries will be empty. You'll need to export images from your original iPhoto library, and then import them into the libraries you just created. You'll find some helpful guidelines, as well as a step-by-step outline of the export/import process, on the next page. There are a couple of options for exporting iPhoto images. You can export the unedited master of an image or the edited current version. I prefer to export the master, to ensure that I always have the original image from my camera in my iPhoto libraries. Now that you've created all of the iPhoto libraries you wish to use, it's time to populate them with master images from your original iPhoto library. But before we start the export process, a word about iPhoto masters vs. edited versions. iPhoto creates and retains an image master whenever you add a photo to the iPhoto library. The master is the original image, without any of the edits you may perform later. Early versions of iPhoto stored original images in a folder called Originals, while later versions of iPhoto call this special internal folder Masters. The two names are generally interchangeable, but in this guide, I'll use whichever term iPhoto displays in specific commands. There are a couple of options for exporting iPhoto images. You can export the unedited master of an image or the edited current version. I prefer to export the master, to ensure that I always have the original image from my camera in my iPhoto libraries. The disadvantage of exporting the master is that when you import it into your new iPhoto libraries, you'll be starting from scratch. Any edits you may have performed on the image will be gone, as will any keywords or other metadata you may have added to the image. If you choose to export the current version of an image, it will contain any edits you may have performed on it, as well as any keywords or other metadata you may have added. The image will be exported in its current format, which is most likely JPEG. If the original version of the image was in another format, such as TIFF or RAW, the edited version won't have the same quality, particularly if it's in JPEG format, which is a compressed version. For this reason, I always choose to export the master of an image when I'm creating new libraries, even though it means a little more work down the road. Hold down the option key and launch iPhoto. Select your original iPhoto library from the list of available libraries. 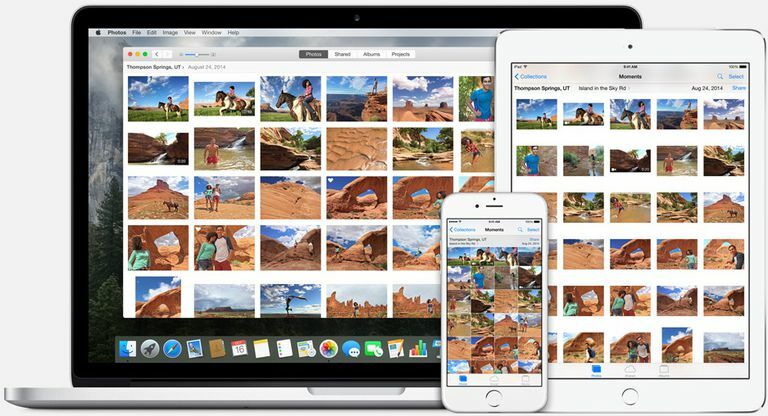 Select the photos you wish to export to one of your new iPhoto libraries. In the Export dialog box, select the File Export tab. Original: This will export the original image master in the file format used by your camera. (If the photo came a source other than your camera, it will retain the format it was when you first imported it into iPhoto.) This will produce the best quality image, but you'll lose any edits you performed or any metatags you added after you imported the image into iPhoto. Current: This will export the current version of the image, in its current image format, including any image edits and any metatags. JPEG: Same as Current, but exports the image in JPEG format rather than its current format. JPEGs can retain title, keywords, and location information. TIFF: Same as Current, but exports the image in TIFF format, rather than its current format. TIFFs can retain title, keywords, and location information. PNG: Same as Current, but exports the image in PNG format, rather than its current format. PNH does not retain title, keywords, or location information. When you select JPEG or TIFF as the Kind, you can choose to include the image Title and any keywords, as well as Location information. Use title: If you have given the photo a title in iPhoto, the title will be used as the file name. Use filename: This option will use the original file name as the photo's name. Sequential: Enter a prefix that will then have sequential numbers attached. For example, if you select the prefix Pets, the file names will be Pets1, Pets2, Pets3, etc. Album name with number: Similar to Sequential, but the album name will be used as the prefix. Make your selections, and then click the Export button. Use the dialog box that opens to select a target location for the exported images. I suggest selecting the Desktop, then clicking the New Folder button to create a folder for the exported images. Give the folder a name associated with the final library destination. For example, if a set of exports is destined for your new Pets library, you could call the folder Pets Exports. Click OK after you select a destination. With all of your new iPhoto libraries created (page 2), and all of your iPhoto images exported from the original iPhoto library (page 3), it's time to import your photos into their appropriate libraries. With all of your new iPhoto libraries created (page 2) and all of your iPhoto images exported from the original iPhoto library (page 3), it's time to import your photos into their appropriate libraries. This is by far the easiest part of the process of creating and using multiple iPhoto libraries. All we need to do is launch iPhoto and tell it which library to use. We can then import the photos we previously exported, and repeat the process for each additional library. Select one of the new iPhoto libraries from the list of available libraries. From the File menu, select Import to Library. In the dialog box that opens, navigate to where you saved the exported images for this particular library. Select the folder that contains the exported images, and click the Import button. That's all there is to populating your new iPhoto library. Repeat the process for each new iPhoto library you created. Once you've populated all of your iPhoto libraries with images, you should take some time to work with each library. Your original iPhoto library is still available; it contains all of your current iPhoto images and all of their masters. Once you're satisfied with your new iPhoto library structure, you can delete the duplicate images from the original library in order to gain back some drive space, as well as give the original iPhoto library a bit more of a snappy performance. Now that all of your iPhoto libraries are populated with photos, and you've taken the time to test every library, to make sure it works as you intended, it's time to say goodbye to the duplicates stored in your original iPhoto library. But before you do that, I highly recommend backing up the original images, as well as all of the iPhoto libraries you created. With all the images you've been moving around, it would be very easy for one or two to drop between the cracks. And in the process of cleaning up, you might end up consigning those wayward images to the trash. Creating a backup now could save some heartache down the road when you realize that there are photos that you haven't seen since you reorganized iPhoto. You can use any backup method you wish, with the exception of Time Machine. Time Machine isn't a way to archive data for later use. Over time, Time Machine can delete older files to make way for newer versions; that's just the way Time Machine works. In this case, you want to create an archive of your iPhoto libraries that you can access tomorrow, or two years from tomorrow. The simplest way to create an archive is to copy your iPhoto libraries to another drive or burn them to CDs or DVDs. The deletion process is a simple one. Open your original iPhoto library in iPhoto, and drag the duplicate images to the Trash icon in iPhoto's sidebar. Once the duplicates are in the trash, you can permanently delete them with just a mouse click or two. Select the original iPhoto library from the list of available libraries. Select the images and either drag the thumbnails to the Trash icon in the sidebar, or right-click on a selected image and click the Trash button. Repeat until all of the photos you moved to another library have been placed in the trash. Right click the Trash icon in the iPhoto sidebar and select Empty Trash from the pop-up menu. That's it; all of the duplicate photos are gone. Your original iPhoto Library should now be as lean and mean as the rest of the iPhoto libraries you created.